Multicoater is a roller coater for applying both large quantities of paint and very thin layers, using two application rollers with different compositions. This technology is suitable for use with high-productivity operation and also on small batches, with the maximum paint saving in all situations thanks to an airtight system without product recycling. 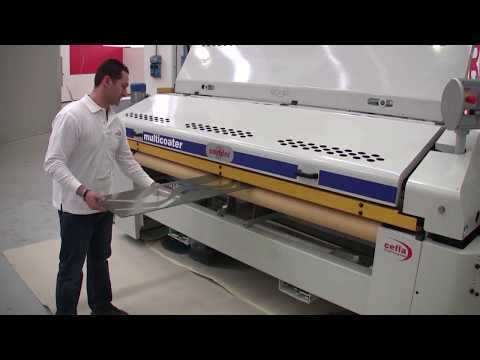 It also has a rapid application roller cleaning system, which cuts colour change times. All the machine's various operating functions are completely controlled by a PLC touch screen with user-friendly interface. Multicoater is the roller machine designed for the glass market which allows various decorative effects to be applied with no need to change the application roller. Paint-free edges guaranteed.